The RESTORE Commercial Software license allows a business to use the Software on up to 3 computers to improve consumer images. Additionally, the consumer can use the Software to improve images on consumer access computers, too. 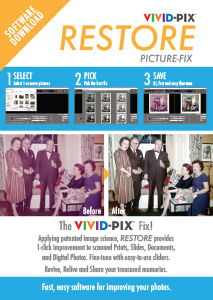 Stop spending minutes or hours to improve images, when it only takes seconds with Vivid-Pix Commercial Software. 1. The Vivid-Pix Commercial Software license allows a business to use the Software on up to 3 computers to improve consumer images. Additionally, the consumer can use the Software to improve images on consumer access computers, too. 2. Up to 18,000 images per year are included in the Commericial Software license. (1,500 image imprrovements per month are included in the annual license). After the monthly amount is surpassed, the price per click is cut in half. The online back-end keeps track of how many images are "Saved" and provides a monthly bill for additional use. 3. Example: $199 / 18,000 = $.011 (about a penny a fix). When saved fixes surpass the included amount, the price is cut in half: $0055/fix. Double your # of fixes and only pay $100 more per year to enable LAND & SEA SCUBA Picture-Fix Commercial Software.